About five and a half million Soviet soldiers were held by the Nazis, less than half of whom survived, Gauck said in the interview to the daily Sueddeutsche Zeitung. According to Gauck, these Soviet people are in an “oblivion zone” when it comes to collective memory, and this is unfair. Gauck has praised Soviet Army soldiers who played their part in ending the WWII. In the interview the German President also said he understands Athens’ calls for WWII reparations, saying that Berlin should examine its historical responsibility to Greece. Many Greeks blame Germany, as the country's biggest creditor, for the tough austerity measures and record high unemployment it has faced after getting two international bailouts total worth €240 billion. In April Athens ruled that Germany owes Greece no less than €278.7 billion in World War II reparations. Berlin earlier flatly denied it owes Athens any more money, saying it already paid Greece war damages of $25 million in the 1950s, equivalent to $220 million today, and also paid out 115 million Deutschmarks (a sum worth around $230 million today), to victims of Nazi crimes in the early 1960s. 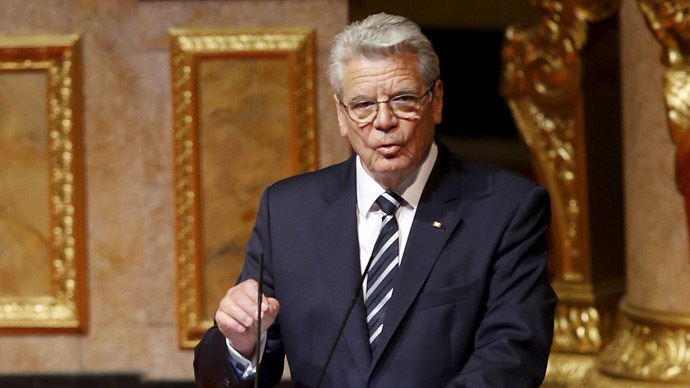 Gauck’s words were echoed by Chancellor Angela Merkel, who also said that Germany should not forget its Nazi past and try to be sensitive to those nations that were affected in the World War II. Merkel said that she was looking forward her May 10 meeting with Russian President Vladimir Putin. “To date, there is huge controversy between Russia and us [Germany], including the issue of what is happening in Ukraine. However, it is important to me to jointly lay wreaths on the Tomb of the Unknown Soldier on May 10 with the Russian President,” she said. Chancellor Merkel, as well as other leaders including US Barack Obama and UK David Cameron, will not attend the May 9 celebrations in Moscow amid tensions with Ukraine.